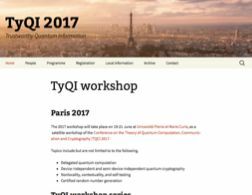 The TyQI workshop series emerged from a wish to address the multidisciplinary challenge of what can be accomplished with untrusted quantum devices. The topics include but are not limited to delegated quantum computation, device-independent and semi-device-independent quantum cryptography, nonlocality, contextuality and self-testing, and certified random number generation. The first two workshops were held at Ann Arbour, USA (2015) and Shanghai, China (2016).